Spring is almost upon us! All that has been buried throughout the frozen winter months is waiting to burst forth: bulb flowers, bird song, new grass. Out of the fertile, moist earth, our renewal comes forward as we move toward the spring equinox later this month. Hath in the Ram his halfe course y-ronne . . . I can never resist the music of the Middle English! It’s just close enough to our modern speech to resonate like a dream memory, with its sweet showers piercing the drought of March, the liquor that brings forth the flowers, the sweet wind and the young sun having run its half course in the time of the Ram, from March 21 to April 21, the equinox, the middle year. TS Eliot, the poet who exhorted us that good poets borrow while great poets steal, riffed on Chaucer calling April “the cruelest month, breeding lilacs out of the dead land, mixing memory and desire, stirring dull roots with spring rain.” His modernist corrective to Chaucer’s gleeful pilgrimage. Our Valley is a great place for spring pilgrimages. 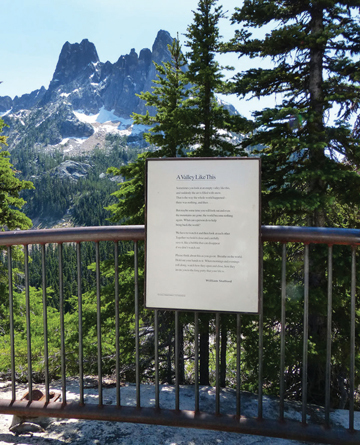 One way to enjoy both poetry and nature is to visit the “Methow River Poems” plaques by the poet William Stafford that meander along the river from Pateros to Winthrop. The Forest Service approached Stafford in 1992, a year before his death, to write a series of poems that would reflect the landscape and spirit of the North Cascades. Stafford has long been associated with the expansiveness of nature and of the human spirit. A lifelong pacifist, Stafford’s relaxed and conversational poetics reflect his embodiment as a human being. Writing of a late night flat tire in the mountains of California when the only traffic that passed in the dark was a flock of Hells’ Angels, his son described his father’s “studied slouch,” a relaxation of his body that innately communicated his inner cool. Neither predator nor prey, his Being emanated composure and utter peace with the world. Which brings us to the River Poems. Asked by the Forest Service to write poems that might serve as meditative plaques along the Methow, Stafford followed his own “hidden river” to produce seventeen poems, seven of which were originally selected for plaques. Two or three of these are in the area of the Pass. To keep your pilgrimage close to home, here’s a meditation on the four that are nearer at hand. But I’m starting in the middle of things. The remaining plaques run from Mazama, or vice versa depending on which source you consult, or where you begin! Let’s start with the plaque at the confluence of the rivers, roughly across from the Rest Awhile Fruit Stand. chaos that seem to be going somewhere. Like “Ask Me,” this poem investigates the paradoxical nature of Nature as experienced through human consciousness. Everything is breathing. Life is “tranquil chaos . . . with a great peacefulness in it . . . motionless turmoil.” The location of this plaque where the two rivers merge captures that nature of what is fluid and also concrete. Methow. Columbia. Two names for one water on its way to the sea. “nonchalant.” Like “Ask Me,” there’s a paradoxical stance in the poem. Midway through, he introduces the reader “You can see,” and in the stanza below “Now and then one stirs when nobody is looking, then it stops and looks away.” The shift in perspective from watcher to watched is couched in amusing personification, but it points to a complex relationship between seer and seen: what we look for we often miss. This speaks with the same poignancy and humility as “Ask Me.” It begins in fog and rain and ends in the importance of human connection. Daylight will love what came. saying a prayer for all that’s gone. If you have the stamina to go as these poems ask us, all the way, to touch and see and become, then you will experience more than what the vistas, the river music, the trees, rocks and clouds themselves convey. The word poetry comes from the Greek and means “a made thing.” A poem is not an accident. It’s not a natural occurrence. It’s a translation or interpretation of what is experienced by these sensitive instruments of human consciousness into something that is at once greater and less than what they have perceived. Commissioning these plaques was a gesture toward this truth. We can read the poems in the comfort of home; we can hike and imbibe the trails’ messages directly through our senses. And in a handful of places, we can experience both our own and another’s impressions, a synesthesia of sorts, where the written word lands in our heads, our hearts and our bellies to nourish the deepest parts of us. Methow residents Curtis Edwards and his wife Sheela McLean placed the Stafford poems on the river in 1993-94 while working for the Forest Service. “It started as interpretive signs about the river (Respect the River program) and developed into the companion signs when we went looking for some truly inspiring writing, ” says Edwards. “The Methow River poems were some of the last he wrote.” Edwards has recently repaired and replaced several of the plaques throughout the valley. Explore our Public Art Map to find the locations of the Methow River Poem plaques in the Methow Valley. Contact: info@methowartsalliance.org, 509.997.4004. Subhaga Crystal Bacon is Executive Director of the Methow Valley Community School. If you have an interest in submitting writing, photography, artwork or poetry in our ART Magazine, please email us at info@methowartsalliance.org for information.